Georgi's Gem . . .discounts for last minute and longer stays !! 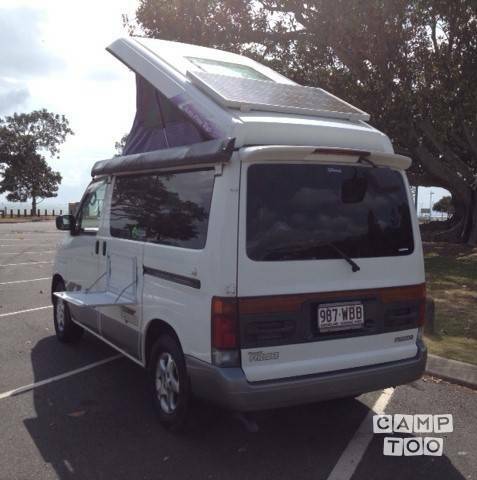 This Mazda (electric) pop top has everything you need and takes minutes to set up making it ideal for short stays in multiple locations and/or for those who want to keep things simple and easy. Just bring your food and drive away. The internal fit-out is still relatively new, neat and tidy. Seats four with seat-belts. The two passenger seats in the back easily convert into a double bed and the pop top provides a second double bed. This area can sleep two adults but is more comfortable with one adult or an adult and one child due to ease of access up and down. This area is fully screened and has a glass roof - perfect for catching breezes and star gazing! The solar panel on the roof makes this van suitable for un-powered sites but it can just as easily be used on powered sites by plugging the fridge into power. Be sure to expose the solar panel to the sun for optimal performance - avoid parking under a tree. Everything included and in excellent condition: mattresses, fridge/freezer, sink, 10L water tank, fire extinguisher, fold out internal table, eating utensils, external strip lighting (attached to van, plugs in to 12v) pots/pans, plates, gas cook top + 1 x butane gas cylinder (to get you started), privacy blinds, mattress protector (bottom mattress), tinted windows, fold up table and 2 x bench chairs, smaller fold up table, camping chairs (up to 5), 2m x 2.5m attached awning plus additional side awning (for extra weather protection) and externally fitted fold out table. Pillows, pillow cases and sheets can be supplied. Just bring your sleeping bags or quilts, as you prefer. Ground sheet (3m x 2.5m) can be included but needs to come back clean so, for short stays, it's not recommended. If there's something else you need, ask me - I may have it and be able to include it at no extra cost. Pop up change /privacy tent, mobile toilet, TV/aerial, baby weber, 12v cold water shower and bike rack also available (if required) (extra fees apply). No smoking in or around the camper. Stick to speed limits at all times. Treat it like your own. If the van is returned unclean inside and /or out a professional clean will be arranged and the cost taken from the bond (current cost for this is $70). Georgi was really helpful in every aspect of hiring the van. The van is great - very easy to drive and comfortable for sleeping. It is compact inside the van, so you need to set your living space up outside the van under the awning. We were lucky enough to have great weather throughout so we really enjoyed our stay. A big thank you to Georgi for Georgi's Gem! The van exceeded our expectations. It has been excellently maintained and was easy and comfortable to drive. The Gem had everything we needed for a three person holiday. We slept comfortably, the fridge was fantastic and we had everything was supplied to cook, prepare meals, clean up and eat at a table. Georgi is a great communicator and was really accommodating when we wanted to make last minute changes to our booking. We could camp comfortably anywhere in this van. Overall, this was an excellent experience - we would recommend this van to anyone and would hire it again ourselves! Thanks again Georgi! 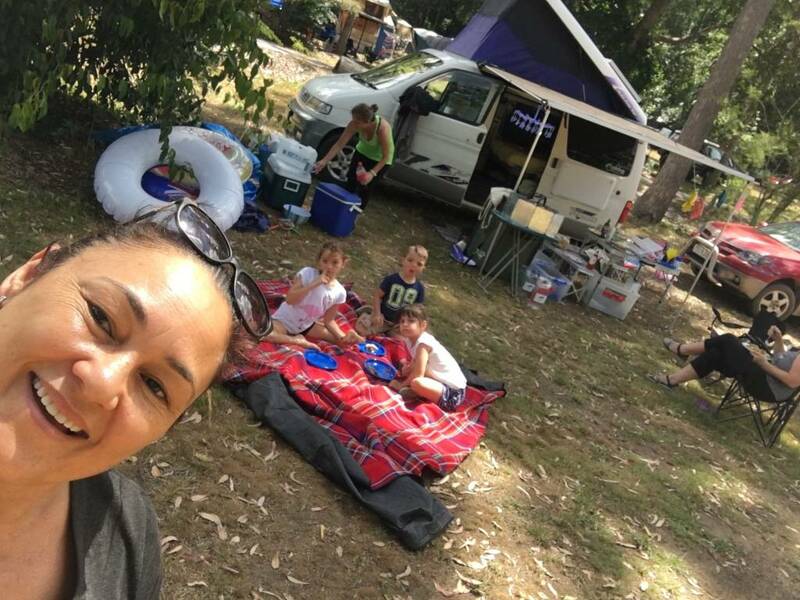 My daughter and I had an amazing long weekend in Georgi's camper , the van was clean, reliable and contained everything we needed for our short trip. I would recommend this no fuss holiday option for those dreaming of van life! Thanks Georgi! We would love to experience the adventure again in the future. Georgi ' s van was perfect for our little trip up the coast. The van is really comfy, well equipped and super easy to drive. It takes the open roads well and easy to manure around town. We loved our adventure and Georgi was so accommodating and easy to deal with. The auto pop top and screens made it really great for the warm weather and the easy blinds on windows perfect to block out the early bird & sun. Great little van and would love to rent it again someday. Thanks Georgi for your flexibility, patience, understanding and help. Georgi was very accommodating and friendly. Her van is in immaculate condition and works very well for camping. Would strongly encourage others to give it a try. Thanks Georgi!